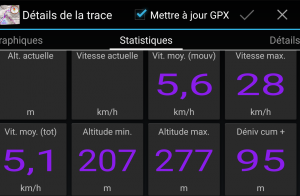 In order to calculate the cumulated altitude differential, MyTrails must identify parts of the altitude curve where the track switches from uphill to downhill or vice versa. Because altitude measurements are not exact (especially from the GPS), MyTrails uses a filter to attempt to differentiate measurement errors from actual changes in the track. Different applications use different filters, which may yield very different altitude differentials. You will get better results when using altimeter-derived altitudes, or after applying altitude normalization (when saving the track, or in the Track Manager). In MyTrails 2.0.11 and later, you can additionally use two options in Preferences > Sensors: Altitude stabilization (which performs some filtering on GPS altitude data to reduce the noise) and Cumulative climb filter, which you can set higher to avoid MyTrails overestimating cumulative climb when the GPS data is very noisy. This entry was posted in FAQ, Track and sensors on 17 April 2015 by frogsparks.